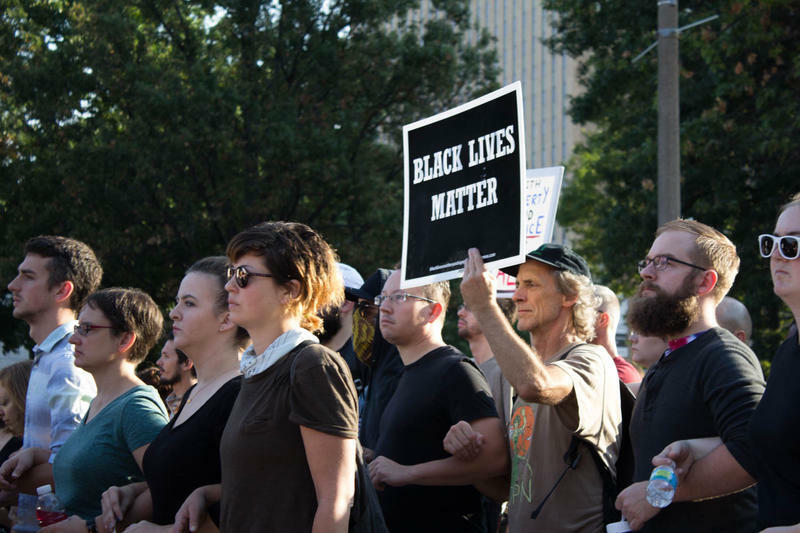 Protesters marched peacefully and largely in silence throughout downtown St. Louis early Monday morning. 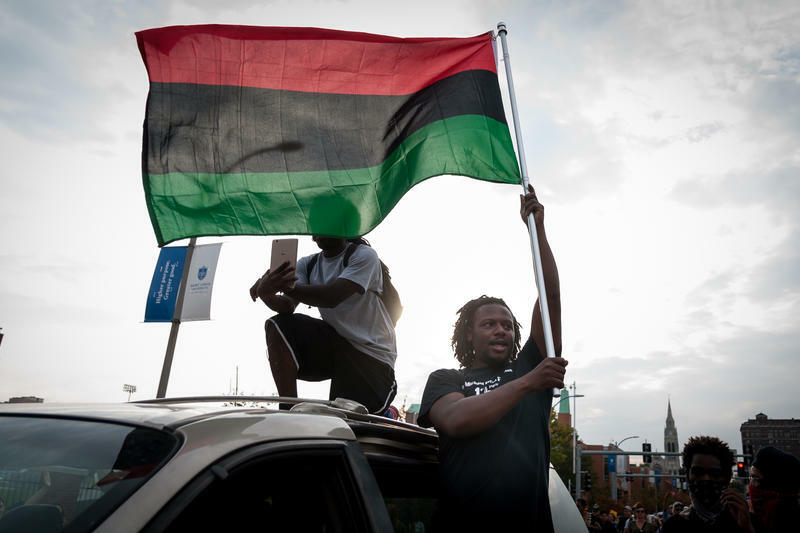 Updated at 6:45 p.m. to recast throughout, add details about cleanup — When morning broke Monday, about 100 people already were in the streets of downtown St. Louis to silently protest the acquittal of former St. Louis officer Jason Stockley and high schoolers in the suburbs were walking out of classes. It was the fourth day of action since a judge decided Stockley wasn’t guilty of first-degree murder in the 2011 shooting death of Anthony Lamar Smith. More than 150 people have been arrested since Friday’s verdict, including 123 people Sunday night in downtown, where businesses mended broken windows Monday. An evening protest took place in the Delmar Loop, which hosted a largely peaceful demonstration Saturday before a few people broke several windows. 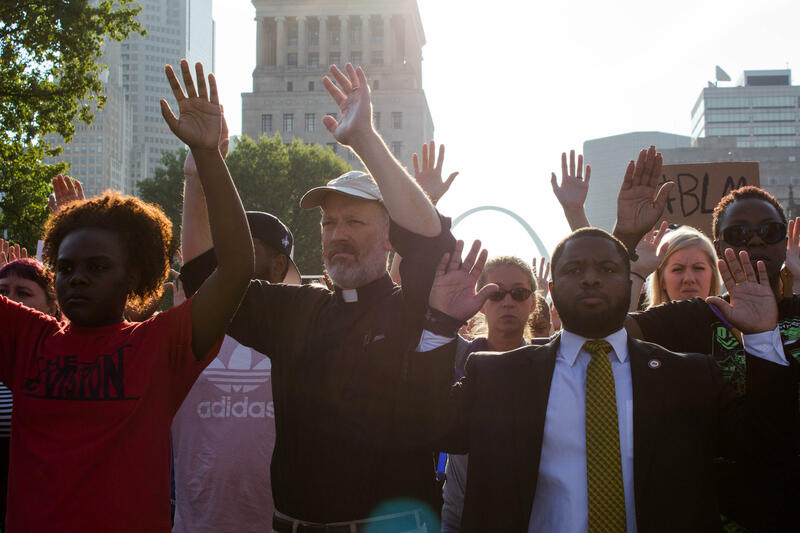 Protesters stood silently with hands raised in the middle of Market Street near St. Louis City Hall. What was different about Monday morning’s protest was the sound — or lack thereof. Protesters walked in parade formation, sometimes with arms linked, their footsteps and a lone drumbeat occasionally punctuated by the murmur of helicopters overhead. The gathering began at 7 a.m. at Market and 16th streets, then processed toward the Gateway Arch and then City Hall. There, organizers spoke to the crowd. Organizer Cori Bush spoke to the crowd of protesters as they stopped in front of the St. Louis Municipal Court building demanding subpoena power be granted to the Civilian Review Board. “Just our presence is powerful,” Cori Bush, one of the coordinators said. 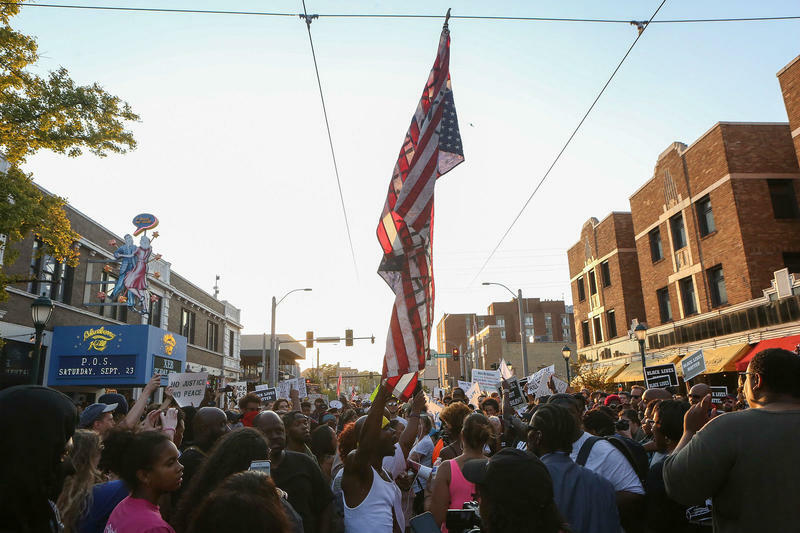 State Rep. Bruce Franks Jr., D-St. Louis, told St. Louis Public Radio that the organized protests will continue indefinitely, and that they’ve been controlled. Jorie Schuckman of south St. Louis listens to protest organizers as her daughter Greta, 4, covers her ears. In the crowd, St. Louis resident Jorie Schuckman held her 4-year-old daughter Greta on her hip. Schuckman wasn’t part of the protests after Michael Brown’s 2014 death in Ferguson, but now that her 6-year-old daughter attends a predominantly African-American school, she sees things with new eyes. Schuckman doesn’t know if either child can understand right now why their mother is marching in the streets. “I don’t know how to explain this to them, but this is how I can make a difference right now,” she said. 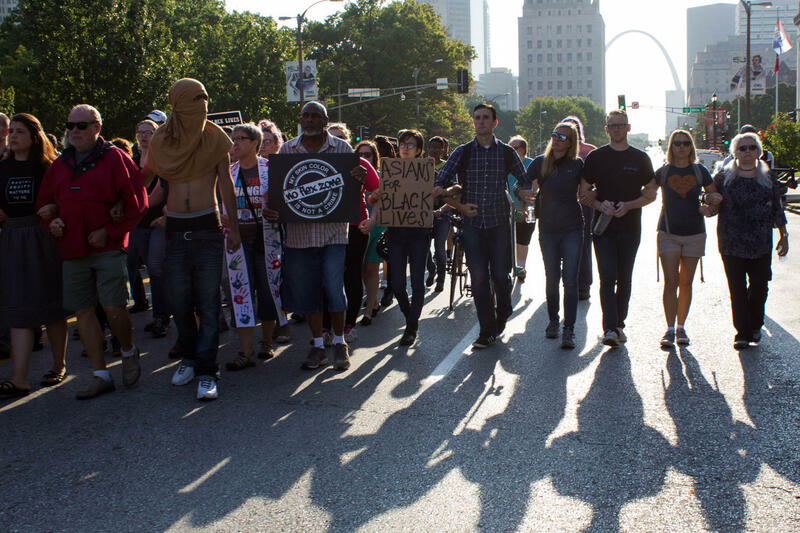 The morning protest was peaceful with no confrontations with St. Louis police. Students demonstrated at Kirkwood, University City and Webster Groves high schools Monday to call attention to what they believe is a discriminatory judicial system. In Kirkwood and Webster Groves, the students said they were also worried that predominantly white high schools were suppressing minorities. Black students organized the walkouts, but a roughly equal mix of black and white students participated. 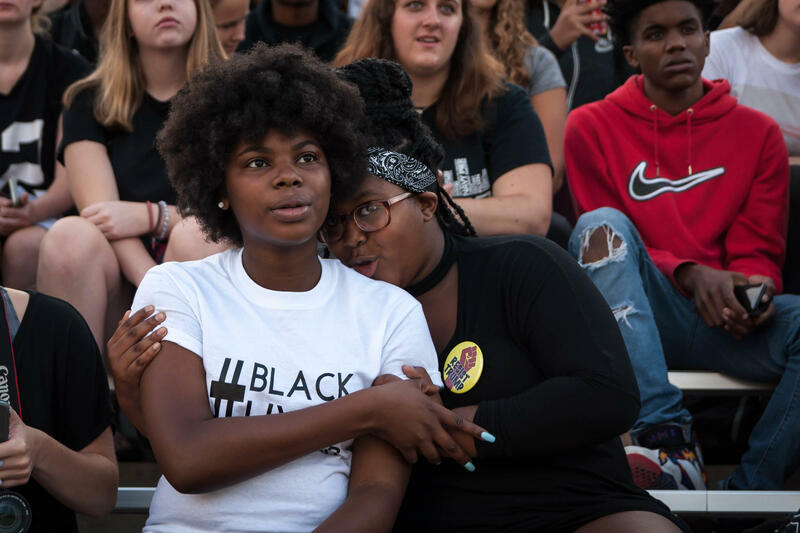 At Kirkwood High, students gathered at 7:40 a.m. and walked to the football field, chanting “No justice, no peace” and “Black Lives Matter.” They sat in the bleachers and observed a moment of silence. Several students then gave speeches and discussed the culture at the school. “Friday was my breaking point,” 17-year-old senior Sha’Diya Tomlin said of Circuit Judge Timothy Wilson’s decision to find Stockley not guilty. She’s attended Kirkwood for three years, having transferred from the Riverview Gardens School District after it lost state accreditation. Kirkwood High School students Sha'Diya Tomlin, left, and Aysha Gray listen to speakers at a walkout and protest they organized Monday morning at the school. A few black students — including Tomlin and other student leaders — said they don’t think the school supports black students enough. “As a black student, I do not feel like my school supports everything, every cause that we feel like we need to push,” Tomlin said. At Webster Groves High, students walked out at 10:10 a.m. and met in the street, chanting and holding signs with phrases, including “All lives don’t matter until black lives matter.” They then took several laps around the school grounds under the watch of faculty and police. 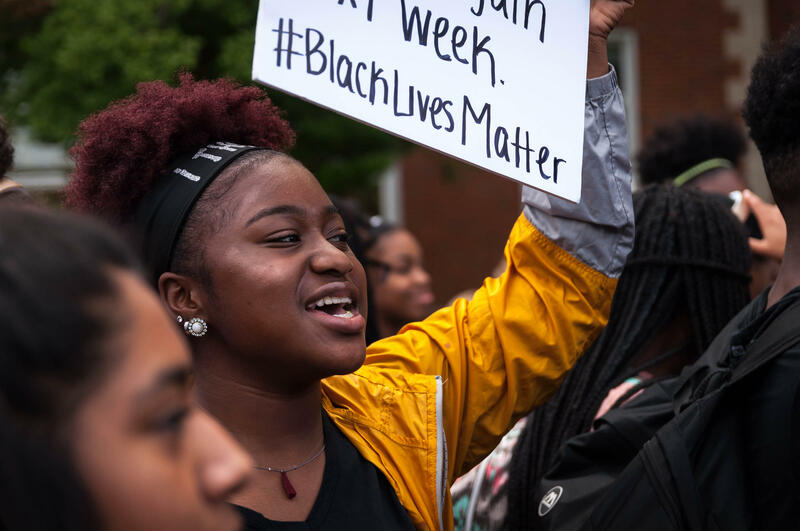 “It was another moment of not being surprised by the judicial system’s disrespect of black bodies and black lives,” 17-year-old senior Aysha McHaynes said. Students also demonstrated at University City High School, where they were met by Superintendent Sharonica Hardin-Bartley. In a tweet, the district called the protest peaceful and effective. Administrators at all three high schools said they support students’ right to demonstrate and speak their minds. However, students at Kirkwood and Webster Groves received unexcused absences for the class time missed. Jamie Tabron, 17, a senior at Webster Groves High School takes part in a student walkout and march at the school Monday morning to protest the acquittal of a white ex-St. Louis police officer on charges of murdering a black student. “This walkout is a way for us to come together,” she said. 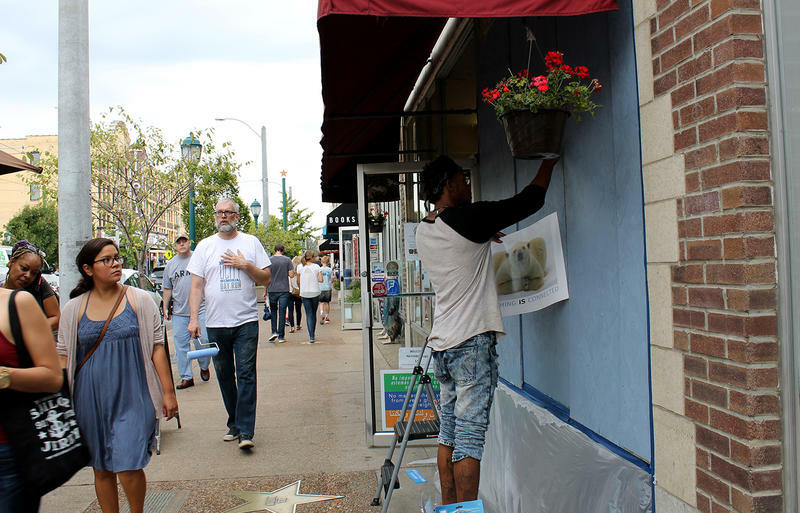 Business owners used Monday to clean up storefronts after the confrontation between police and protesters Sunday night, though the damage happened long after the official, and peaceful protest ended. The last group of people to be arrested downtown were boxed in by police and sprayed with a chemical agent, a livestream showed, and a St. Louis Post-Dispatch reporter Mike Faulk was among the crowd; he was released Monday. St. Louis Interim Police Chief Larry O’Toole said early Monday morning that his department was “in control,” and that the police “own the night." Roger Lee manages Sushi Ai, which was damaged. He said he was busy Monday. Several volunteers, including Dana Kay Goddard, helped paint a mural on the plywood covering Sushi Ai’s busted windows. She said the images of police arresting people are creating an unwarranted perception of danger. St. Louis Alderman Jack Coatar said the businesses also took a hit after U2 and Ed Sheeran canceled concerts, but so did the workers at the Edward Jones Dome and the Scottrade Center and at nearby restaurants. Republican Gov. Eric Greitens and St. Louis Mayor Lyda Krewson, a Democrat, promised during their recent campaigns to make people feel safe. Last week’s acquittal of a white ex-police officer of the first-degree murder of a black man is putting their words to the test, and activists and elected officials aren’t sure Greitens and Krewson are earning passing grades.